Credit: Alan Wilson via Wikimedia Commons. 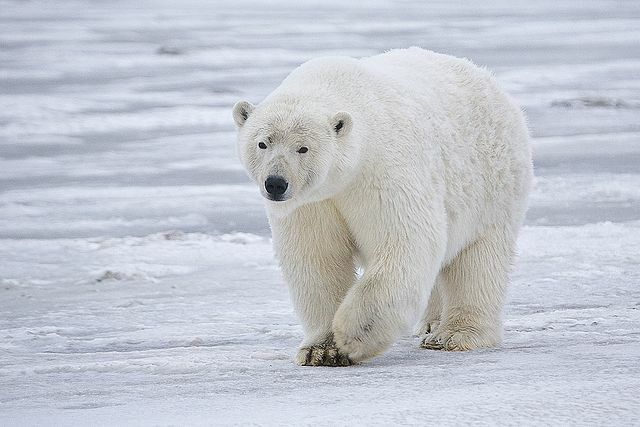 ?Global average air temperature has warmed by 1 Celsius (°C) over the past century, and in response, the cryosphere—the part of the Earth’s surface most influenced by ice and snow—is changing. Specifically, alpine glaciers are retreating, the expanse of Arctic sea ice has been shrinking, the thickness and duration of winter snowpacks are diminishing, permafrost has been melting, and the ice cover on lakes and rivers has been appearing later in the year and melting out earlier. Although these changes are relatively well documented, the ecological responses and long-term consequences that they initiate are not. Changes in foodwebs resulting from the loss of habitat and from the loss of species or the replacement of species (a.k.a. the big stuff we tend to notice and take photos of). Changes in the rates and mechanisms of biogeochemical storage and cycling of carbon and nutrients, caused by changes in physical forcings or ecological community functioning (a.k.a. the little stuff that’s hard to see but that underpins the big stuff in #1). A firn field of old, recrystallized snow: Doronenko via Wikimedia Commons. Decreasing snowfall threatens burrowing animals and makes plant roots more susceptible to injury because snow acts as an insulator. Disappearing sea ice has led to declines in the abundance of diatoms (phytoplankton), primary producers of the marine foodweb that support krill, which support seabirds and mammals. 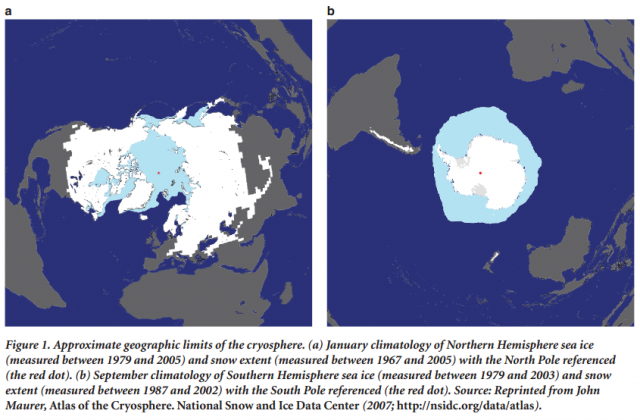 Disappearing sea ice also seems unexpectedly to be decreasing the sea’s uptake of carbon dioxide from the atmosphere. 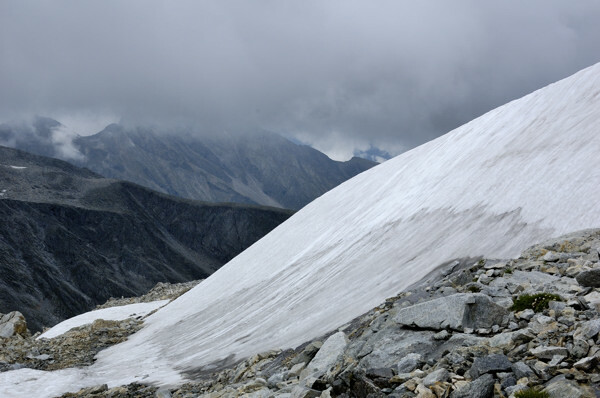 On land, changing snowpacks can alter plant communities. Melting permafrost affects the quantity of carbon dioxide that plants and microbes take out of the atmosphere, in ways that change over time. Shrinking glaciers add pollutants and increased quantities of nutrients to freshwater bodies. Melting river ice pushes more detritus downstream. Disappearing ice on land and resulting sea-level rise will affect social systems, economies, and geopolitics. Many of these changes are already evident in the ski industry, in infrastructure and coastal planning, and in tourism. Significant effects to water supplies and therefore agriculture are predicted. The video from the NASA Goddard Space Flight Center Scientific Visualization Studio shows dwindling perennial Arctic sea ice from 1980 to 2012. The gray disk at the North Pole shows where no satellite data was collected. The second half of the video (wait for it) plays the same animation but without the overlay graph.